What sets us apart from other legal firms? We have been established since 1975, providing Ipswich with leading legal advice! Our office has been around for nearly 38 years in the same location and Brett himself has been practicing since 1979. Be comfortable in the knowledge that your legal case will be conducted by Brett Smith personally and it will not be passed off to an associate, a paralegal or an inexperienced junior practitioner. Your work will be done by a solicitor with 35 to 40 years experience in most facets of the law, which is a comfort that is almost impossible to find elsewhere. 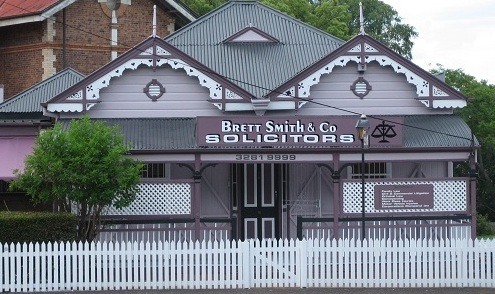 Brett Smith & Co is a leading Queensland Law Firm located on the corner of East and Churchill Streets, Ipswich. Our offices are adjacent to the old police station and next door to the Medicross Centre and Hospital. We strive to meet or exceed the expectations of our Clients. Every Client receives the best legal representation possible. With almost 40 years of experience, we strive to operate as one of the region’s most preferred law firms.